The cast Iron Parasol Base is considerable in weight, and will help to withstand windy conditions and make sure your Parasol does not fly away! We stock Antique Bronze and white parasol bases. Brilliant service! Thank you. Very helpful re telephone queries and very prompt delivery. Well packed. Will certainly recommend. This is the third time we've bought furniture from Lazy Susan and once again, it's great service. Everyone I've dealt with has been so helpful, even with our last return which was our fault for selecting the wrong colour! Lazy Susan deserves to do well. Delighted with the after sales service, could not have been more helpful. We ordered a parasol and stand to complete the patio set we ordered earlier in the year. Looks great. Flat pack delivery made transporting to our holiday cottage easy. Excellent performance. Compliant and delivered very fast. very satisfied with all procedures and would certainly recommend you ,indeed have already done so! Lazy Susan provide fast and efficient service. I would not hesitate to recommend them. I appreciate your services because the order is followed up on until the reception of the goods. Thank you very much for your approach. I'll be in touch very soon. ordering and delivery were excellent. 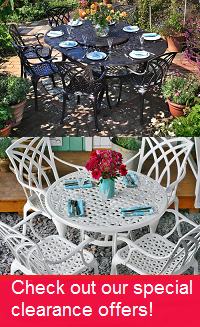 Do make certain when selecting a parasol base that it will fit the table you have bought. The shaft on the base does not fit the Bistro table. Strange really, because you would think selling a bistro table that the Company would make 2 different shafts - a large one for the bigger sets and smaller diameter one for the Bistro sets. So I am stuck with a base that does not fit the Bistro set. I therefore have to use the parasol as a free standing item. That is what I expected!